Recently I had a bad day. And a certain someone (I won't name names) was teething so badly that I thought I might have to dope him with tylenol and pull out all my hair give him some extra nap time. 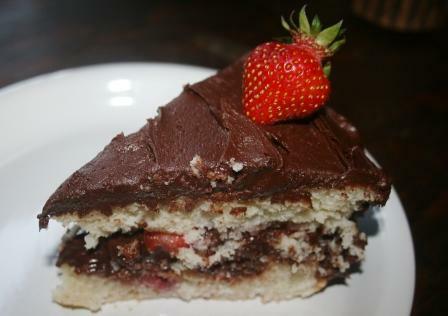 During said nap, I decided to make a strawberry chocolate cake to use up the strawberries we'd picked. I hadn't made this cake in years. And I'd forgotten. Forgotten what an absolute PITA it is to make. Not to mention the recipe is asinine. It calls for things like 2/3 cup of butter. Why couldn't they pick a normal amount? Furthermore, you have to make a MERINGUE and fold it into this really dense batter. A whole separate meringue? Now if that isn't an annoying cake recipe, I don't know what is. So there I was, pretty annoyed. To make matters worse, it didn't get done within the prescribed time. Nope, I had to cook it an extra 10 minutes. Stupid cake. Well, it makes a RIDICULOUS amount of frosting. Can you believe this? There must be 3 cups there! Not one to let things go to waste, I stuck it in the freezer for use on sugar cookies later, but by this time I was TOTALLY over this cake. Me and this cake? We were gonna have it out! And then I took a bite. Layers of cake and strawberries and the most fudgey of frostings ever. That's why I made that silly old cake. In a large mixing bowl, cream butter and 1 1/4 cups sugar. Beat in vanilla. Combine flour, baking powder, and salt; add to creamed mixture alternatively with milk. In a small mixing bowl, beat egg whites on medium speed until soft peaks form. Gradually beat in remaining sugar, 1 tbsp at a time, on high untill stiff peaks form and sugar is dissolved. Fold into batter. Fold in strawberries. Pour into two greased and floured 9 inch round baking pans. Bake at 350* for 20-25 minutes or until toothpick inserted in center comes out clean. Cool for 10 minutes before removing from pans to cool completely. 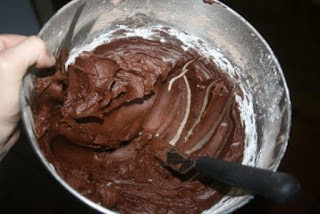 For frosting, in large mixing bowl combine sugar and cocoa. Beat in butter and milk until smooth. Beat in vanilla. Spread frosting over bottom cake layer; top with sliced strawberries. 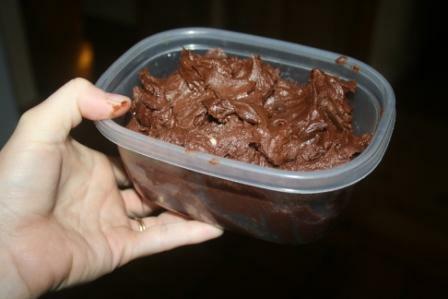 Top with remaining cake layer; frost top and sides of cake. Store in fridge. The cake sounds like a total pain, and absolutely delicious! Since I can't blog right now-I think I will try making that cake! I think I could be in the worst mood on earth and that cake would fix everything! I think that cake could even fix the problems Blogger is having!! It looks so good! No wonder you made that cake - it looked delish. And I love love love chocolate. Hope your little guy is feeling better. That cake looks SOOO yummo!! Sorry it's such a pain in the behind to make. Oh my, it looks worth the work and positively decadent!!! I'm impressed that you made the cake instead of just plopping down somewhere for a rest! Wow! I love chocolate cake! Cake in general is one of my favorites and yours looks delicious. So are you joining the 400 mile challenge for the year? What are you recovering from? I thought the miles you posted last week were really good for a non-recovering person. I would love to just eat the icing! Okay, that is just SINFUL! And I'm in CA, how long is your delivery time? BTW - totally different flavor but I recently made a Lemon Tiramisu that was DECADENT! And man was I glad I had a lot of guests to eat it! Stupid me, I should have read this before grocery shopping tonight! Then we stopped at the strawberry farm to pick up some more on the way home. :) I have like NONE of these ingredients. Bah!!! It looks SO good though. Can you freeze me a piece and bring it to TYpeA? ;) YUM. LMAO Lisa! I learned a long time ago to not bake or cook even when having a bad day. It seems like it will go from bad to worse if you try to do something productive. The cake does look delicious though. LOL. Love your voice in this post. There are annoying recipes like that, and some of them are worth it. Best to be feeling peaceful when baking though. It looks and sounds delicious. Glad you enjoyed the results.